Not to be confused with Ryan Johnson. Rian Craig Johnson (born December 17, 1973) is an American filmmaker and television director. Johnson is best known for writing and directing the neo-noir mystery film Brick (2005), the comedy-drama film The Brothers Bloom (2008), the science fiction thriller film Looper (2012), and space opera film Star Wars: The Last Jedi (2017). He is also notable for directing three episodes of the AMC crime drama television series Breaking Bad: "Fly", "Fifty-One" and "Ozymandias". Both "Fifty-One" and "Ozymandias" have received universal praise, and are considered to be among the series' best episodes. For his work on "Fifty-One", Johnson won the Directors Guild of America Award for Outstanding Directing – Drama Series in 2013. Johnson was born in Silver Spring, Maryland. He grew up in Denver, Colorado and was raised in San Clemente, California since he was in sixth grade. He later attended San Clemente High School (graduating in 1992), where Brick was predominantly filmed. He attended the University of Southern California and graduated from the USC School of Cinematic Arts in 1996. Johnson's first short film, Evil Demon Golfball from Hell!! !, which is loosely based on Edgar Allan Poe's "The Tell-Tale Heart", was included as an easter egg on the Looper Blu-ray. Johnson's film career, as told to Robert K. Elder, author of The Film That Changed My Life, was largely inspired by Annie Hall, a film that he said "broke so many rules in terms of film narrative." He stated: "It moved me in a way that very few other films have moved me. That's something that, I pray to God, if I am able to keep making movies, I can only hope, twenty years down the line maybe, I'll be able to approach." His debut film, Brick, made for just under $500,000, is a crime drama. Johnson has often said that he looked to the novels of Dashiell Hammett as inspiration for the film's unique use of language. While the film is classified as a film noir, Johnson claims that no references were made to film noir during production, so as to focus the production away from reproducing a genre piece. Brick was released on DVD by Focus Features. Johnson directed the video for the Mountain Goats' song "Woke Up New" in 2006. He is a professed fan of the band, and was asked to direct the video when bandleader John Darnielle noticed a reference to them in the credits for Brick. A song is credited to "The Hospital Bombers Experience", which is a reference to the Mountain Goats song titled "The Best Ever Death Metal Band in Denton". Johnson also directed a live performance film of the Mountain Goats' 2009 album The Life of the World to Come. The film consists of a single shot, depicting Darnielle performing the entire album on guitar and piano with minimal accompaniment. This film was screened in New York City, Chicago, Seattle, and Portland, Oregon upon its completion, and was released as a limited edition DVD on Record Store Day (April 17, 2010). Johnson's second film, The Brothers Bloom, is a con-man story released in theaters in May 2009, and later on DVD by Summit Entertainment. Johnson's third film, Looper, began shooting in Louisiana on January 24, 2011 and was released on September 28, 2012 by TriStar Pictures and FilmDistrict. Set in the near future, it has been described as dark science fiction, and involves hitmen whose victims are sent from the future. The film opened the 2012 Toronto International Film Festival and the 2012 Palo Alto International Film Festival. Looper was a surprise success at the box office. Johnson has made a number of short films, some of which are available on his website. His short film from high school titled Ninja Ko is available as an easter egg on the Brick DVD. The Brothers Bloom DVD features a short, Buster Keaton-esque silent film he made in college. After working with Joseph Gordon-Levitt on Brick, the two shot a short film in Paris, France titled Escargots. In 2002, he directed a short film titled The Psychology of Dream Analysis, which is available to view on his Vimeo account. Johnson directed the episode "Manifest Destiny" of the TV series Terriers. In March 2010, Johnson announced on his website that he was directing an episode of the TV series Breaking Bad for its third season. The episode, "Fly", aired on May 23, 2010. Johnson later directed a second episode of the show, "Fifty-One", which aired on August 5, 2012, and earned him a Directors Guild of America Award. He directed a third episode of the show, "Ozymandias", which quickly became widely considered as one of the greatest episodes of television ever aired. On June 20, 2014, news broke that Johnson would write and direct the eighth installment in the Star Wars film series. Johnson confirmed the report that following month and the film, Star Wars: The Last Jedi, was released on December 15, 2017 to positive reviews from critics and from audiences. Though it was initially reported that Johnson would also write the follow-up to The Last Jedi, it is actually director J.J. Abrams and Chris Terrio that are in charge of the script for Episode IX. 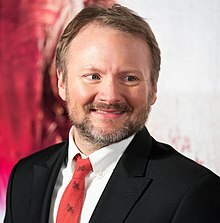 On November 9, 2017, it was announced that Johnson was writing a new trilogy of Star Wars films, separate from the main story arc of previous films in the franchise, and would direct the first installment of his trilogy. However, before Johnson returns to the franchise, he will direct the recently announced murder mystery Knives Out. Johnson penned the script and will work with longtime producing partner Ram Bergman. Aside from filmmaking, Johnson is a folk singer and banjo player. His brother is music producer Aaron Johnson. His cousin, Nathan Johnson, composed the score for Brick, The Brothers Bloom, and Looper. Rian and Nathan make up a folk duo called the Preserves. He has been in a relationship with film writer Karina Longworth since 2011. 2010 Terriers Yes No "Manifest Destiny"
2010–2013 Breaking Bad Yes No "Fly"
2014 HitRecord on TV No Writer "RE: Trash"
No Actor "Out to Sea"
^ Forcella, Dan (September 15, 2013). "Breaking Bad Review: For Family". TV Fanatic. Retrieved May 26, 2017. ^ Ryan, Maureen (September 15, 2013). "'Breaking Bad' 'Ozymandias' Recap: Devastation". The Huffington Post. Retrieved September 16, 2013. ^ Mendelsohn, Tom (September 17, 2013). "Is Breaking Bad's Ozymandias the greatest episode of TV ever written?". The Independent. Retrieved September 18, 2013. ^ Branham, Matt (October 7, 2016). "The 10 Best Episodes Of TV History". CraveOnline. Retrieved February 28, 2017. ^ Bishop, Hunter (February 15, 2016). "The Five Best TV Episodes Of All Time". FanSided. Retrieved February 28, 2017. ^ Carter, Matt (November 24, 2016). "From Buffy To Breaking Bad: What Is The Best TV Episode Of All Time?". Moviepilot. Archived from the original on November 1, 2016. Retrieved May 29, 2017. ^ a b c Dwyer, Shawn (2010). "BIOGRAPHY". Turner Classical Movies. ^ Dawson, Nick (May 15, 2009). "Rian Johnson, The Brothers Bloom". Filmmaker Magazine. ^ "Rian Johnson Biography". iMDb. ^ "Blu-ray.com". Bluray.highdefdigest.com. Retrieved March 5, 2014. ^ Johnson, Rian. Interview by Robert K. Elder. The Film That Changed My Life. By Robert K. Elder. Chicago: Chicago Review Press, 2011. N. p17. Print. ^ Stephen Holden (March 31, 2006). "Joseph Gordon-Levitt Is a Teenage Bogart at Noir High in 'Brick'". The New York Times. Retrieved October 10, 2012. ^ Stephen Holden (May 14, 2009). "My Brother, My Partner in Crime". The New York Times. Retrieved October 10, 2012. ^ "Official Looper production blog". Loopermovie.tumblr.com. ^ Fischer, Russ (May 13, 2009). "Rian Johnson lets slip a few more details about Looper". CHUD.com. Archived from the original on May 17, 2009. Retrieved May 18, 2009. ^ "Looper to launch Toronto film festival". BBC News. Retrieved July 25, 2012. ^ "PALO ALTO INT'L FILM FESTIVAL RETURNS SEPT. 27–30 2012" (PDF). Palo Alto International Film Festival. Archived from the original (PDF) on November 4, 2013. Retrieved September 4, 2012. ^ from rcjohnso Plus 5 years ago Not Yet Rated (August 19, 2008). "Vimeo.com". Vimeo.com. Retrieved March 5, 2014. ^ "TV Squad". TV Squad. Retrieved March 5, 2014. ^ Couch, Aaron; Kilday, Gregg (February 2, 2013). "DGA Awards: Ben Affleck Named Best Director for 'Argo'". The Hollywood Reporter. Retrieved February 7, 2013. ^ Mendelsohn, Tom (September 17, 2013). "Is Breaking Bad's Ozymandias the greatest episode of TV ever written?". The Independent. Retrieved July 31, 2014. ^ Jr, Mike Fleming; Jr, Mike Fleming (June 20, 2014). "UPDATE: 'Star Wars' Bombshell! Rian Johnson To Write, Direct Next Two Films". ^ D'Alessandro, Anthony (December 17, 2017). "Did Audiences Enjoy 'Star Wars: The Last Jedi'? Deciphering Online User Reviews From Exit Polls". Deadline. Retrieved December 17, 2018. ^ "J.J. Abrams to Write and Direct Star Wars: Episode IX". StarWars.com. ^ Jr, Mike Fleming; Jr, Mike Fleming (November 9, 2017). "Rian Johnson To Create New 'Star Wars' Universe Film Trilogy". ^ "Toronto: Daniel Craig Joins Rian Johnson Murder Mystery 'Knives Out'". The Hollywood Reporter. ^ Schulman, Michael (September 30, 2016). "Ghosts of Old Hollywood, as a Podcast". New York Times. New York Times Company. Retrieved November 25, 2017. Ms. Longworth said, at the house in the Los Feliz neighborhood that she rents here with her boyfriend of five years, the director Rian Johnson ("Looper"). 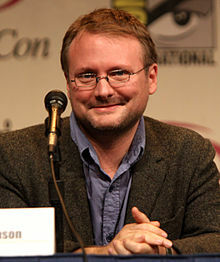 Wikimedia Commons has media related to Rian Johnson.